After the last exciting volume, I couldn’t wait to check out the latest volume of Tokyo Ghoul: re! Need to catch up? Check out my previous review here! Volume 7 of Tokyo Ghoul: re picks right up where the previous volume ended. After taking Sen Takatsuki back to CCG headquarters, Sasaki takes a look at the author’s new book. Titled “King Bileygr”, the novel tells the story of a one-eyed ghoul who leads other ghouls as their king. The most troubling thing about the book is an organization in novel that seems to represent the Washu clan. The organization presents itslef as ghoul collaborators, which would be devastating to the CCG. That isn’t all Sen Takatsuki has up her sleeve though. She reveals the RC scanners aren’t designed to not detect ghouls who belong to V, a secret organization trying to control the world. Takatsuki further reveals that Rize was trying to escape V. Suddenly trusting the ghoul, Sasaki tasks her with recording a conversation planned between Takatsuki and Furata. Once the task has been completed Takatsuki asks Sasaki to kill the One-Eyed King. Meanwhile, the Quinx squad is dealing with their own struggles. The remaining members agree to pay for Haru’s treatment in honor of Shirazu. This would be all well and good if Mutsuki wasn’t currently being held hostage by Torso on Rushima. Wanting to aid their teammate, the Quinx squad and a group of others head to Rushima to take down the Aogiri Tree once and for all. A select group of CCG agents stay at headquarters to guard Cochlea, including Sasaki. Since he isn’t joining his former team on their mission, he tasks Urie with saving Mutsuki. With all of the pieces in place, it’s finally time for Sasaki to hatch his master plan. He quickly begins working on his mission to rescue Hinami. In order to cause a distraction he releases the ghouls on Level 0 and Level 1, all in plain view of the cameras. As CCG agents prepare to apprehend Sasaki, Ayato, Banjo, and other ghouls break into Cochlea with the intent to save Hinami. Sasaki gets to Hinami first and releases her from her cell. After a brief reunion, the two bypass Furata and head to the main area to escape. There, they see Renji facing off against Arima, with Touka and the others watching on. Sasaki urges Touka to take Hinami and the others to escape via a drainage port, then prepares to face off against his mentor. Arima quickly overpowers Kaneki, cutting off his limbs. Kaneki dissociates, heading into his mind where he sees Hide. In an incredibly heartwarming moment, Hide convinces Kaneki to keep living, just as Hide wanted to do with his friend. At the same time, the CCG seems to take control of the escaping ghouls, only to have Takatsuki break out of her cell and go on a rampage. This latest volume of Tokyo Ghoul: re put in a lot of effort to fill in any missing gaps in the plot. The RC scanner revelation is a nice callback to the original series. I had forgotten that the RC scanners didn’t detect Kaneki when he went through them in the original series. It’s interesting to finally know why he made it through. It’s also really cool to see flashbacks to Sasaki/Kaneki’s time as prisoner 240 before Arima took him into his care. Those moments really highlight how difficult the fight must be for the two of them. Another interesting, albeit heartbreaking, plot point is Mutsuki’s backstory. Riddled with abuse from her father and her current abuse from Torso, their life is tragic. I hope they are able to escape Torso and eventually come to terms with the abuse. Despite having some cool character and plot moments, Tokyo Ghoul: re Volume 7 was all over the place in terms of illustration. There is certainly a lot of detail put into close-up moments, such as Sasaki’s “transformation” back into Kaneki, or Takatsuki’s rampage. Other moments though, such a background or transition scenes, are very bland, and often much smaller than their more detailed counterparts. The juxtaposition made reading those frames difficult and really took me out of the moment. Overall though, I really enjoyed this volume and I recommend checking it out! 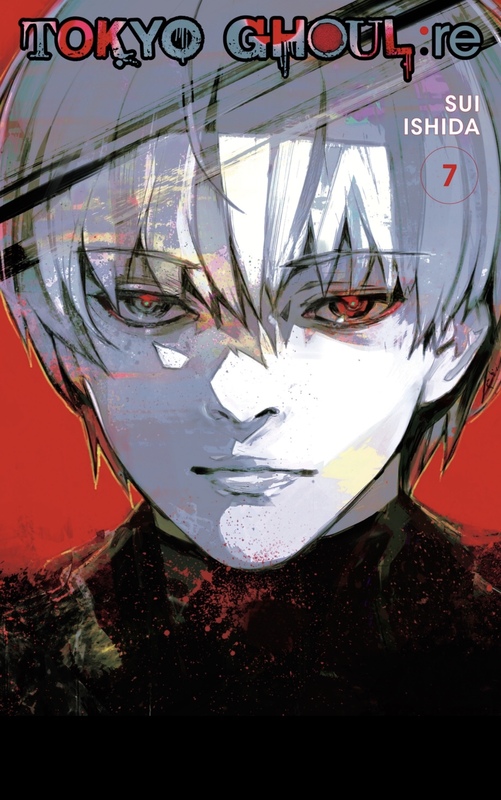 Fans looking to for more information on Tokyo Ghoul: re Volume 7 can find it here from Viz Media.